An otherwise brilliant campaign from Liverpool proved to have an ending that the club will want to quickly forget. First there was The Slip, then Palace's remarkable comeback and now the final day of the season has brought it's own set of indignities. 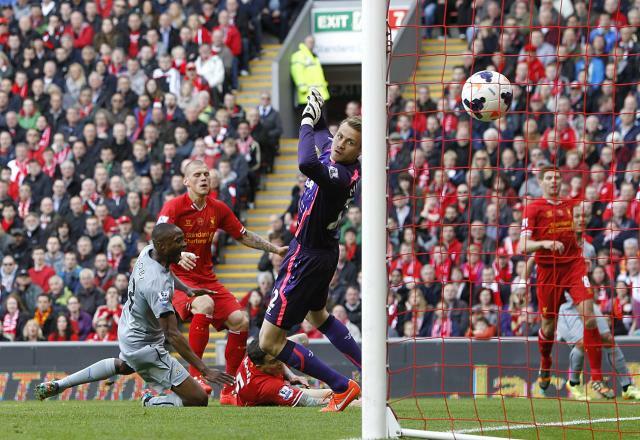 Liverpool needed to beat Newcastle and Man City to lose to West Ham to win their first league title in 24 years. Before Liverpool's match even began, Manchester United fans (looking up at Liverpool from seventh place and out of Europe for the first time in 25 years) hired a plane to fly the message of "United 20 — Gerrard 0" over Anfield. This poke at Liverpool captain Steven Gerrard's chase for his first Premier League title could have provided the cosmic reversal of fortunes that Liverpool needed to stick it to their rivals. Instead, Martin Sktrel set a new Premier League record for own goals in a season (four) in the 20th minute to put Liverpool down 1-0. It wasn't the scoring record Liverpool were looking for (considering Luis Suarez, on 31 goals for the season, had a chance to set a more positive scoring record), but it's the one they got. Man City later took a 2-0 lead over West Ham to make Skrtel feel a little bit better and Liverpool scored twice themselves to take a 2-1 lead of their own. Still, Liverpool will take solace in their return to the Champions League and a season that was far better than anyone expected — regardless of the unfortunate ending.